I made a simple butterfly themed lunch shown in the upper photo, and a quesadilla lunch which he enjoyed on a different day. 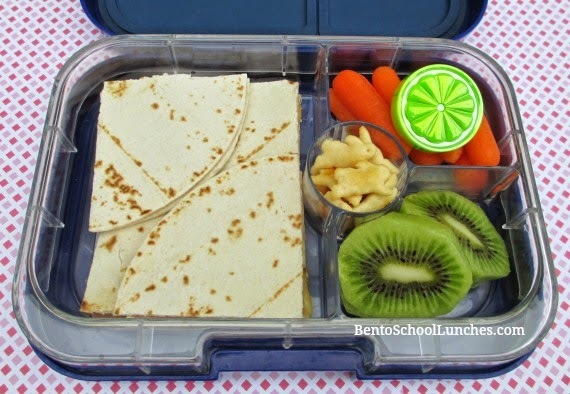 Both of these lunches were packed in his Yumbox Panino. Have a nice Friday and weekend, everyone! 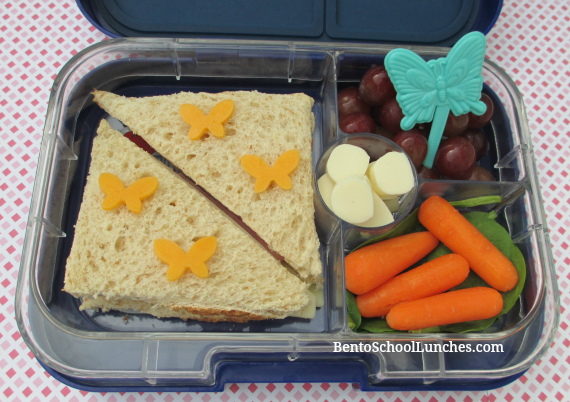 Main compartment: Cheddar cheese butterflies above a sandwich. Sides: Seedless red grapes with a butterfly cupcake pick, mozzarella string cheese slices, organic spinach and organic baby carrots. Here is the quesadilla lunch. Sides: Organic baby carrots, Annie's organic cheddar crackers, organic kiwi slices. Thank you Ming for this kind comment! I am not sure why blogger was unable to publish it. Thankfully the contents were available on my e-mail. Looks good! His solar car challenge sounds fun, hope he had a great time!